Flipper coil used in some later-model Gottlieb games. Includes coil sleeve and diode across solder lugs. 23-520/31-1050 windings, 2.2/40 ohm resistance. 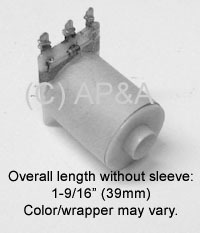 Also replaces Wico # 03-012200.